Social media will save the day for Air Force football fans next month, with the Falcons’ first two games available via Facebook instead of a channel in the triple digits of your local cable service. Air Force’s Sept. 1 season opener against Stony Brook will stream live on Facebook via Stadium, the sports network announced Monday. The Falcons travel to Florida Atlantic the following week for another nonconference showdown, this one airing on Facebook via CBS Sports Network. Both games kick off at 2 p.m. Eastern. The rest of Air Force’s schedule should be a bit more TV-friendly. The team’s eight-game Mountain West Conference slate will be covered by the league’s TV deals with CBS Sports and ESPN, and both nonconference academy rivalry games (hosting Navy on Oct. 6 and visiting Army on Nov. 3) will air on CBS Sports Network. The Falcons finished 5-7 last season, their first sub-.500 year since 2013. A preseason MWC media poll predicted the Falcons will finish fifth in their six-team Mountain Division this year. 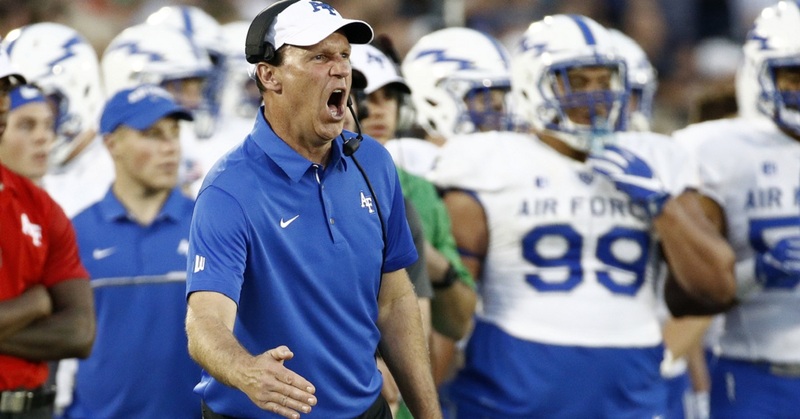 Get the full Air Force football schedule, with TV (and Facebook) schedule updates, here.